Commits Set for U-18 Worlds - College Hockey, Inc.
NHL Network set to carry U.S. games from Russia. Western Michigan commit Mattias Samuelsson is the No. 21 North American skater in NHL Central Scouting’s 2018 NHL Draft rankings. More than 20 future college stars take aim at the 2018 Under-18 World Championship when it gets underway Thursday in Chelyabinsk and Magnitogorsk, Russia. 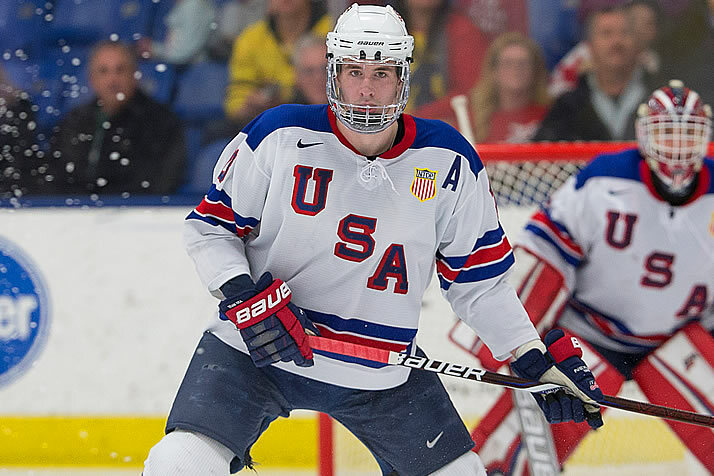 The United States, which features 21 players who have committed to NCAA schools, will have each of its games broadcast on NHL Network as it pursues another gold medal in the event. Last year the U.S. won the tournament for the 10th time in its 19-year history. The U.S. faces Canada – which has two future NCAA players on its roster – Thursday at 10:30 a.m. ET in the first preliminary round game for both teams. Other Group A games for the U.S. are against Switzerland (Friday, 6:30 a.m. ET), Sweden (Sunday, 6:30 a.m. ET) and Belarus (Tuesday, 6:30 a.m. ET), all on NHL Network. Former Rensselaer coach and Ferris State alum Seth Appert is the head coach of the United States, while Quinnipiac head coach Rand Pecknold is among his assistants. Western Michigan commit Mattias Samuelsson captains the U.S. team, which consists entirely of players from USA Hockey’s National Team Development Program. Defenseman Ty Emberson (Wisconsin) and forwards Patrick Giles (Boston College), Jonathan Gruden (Miami) and Jake Pivonka (Notre Dame) were named assistant captains. Wisconsin leads all schools with four recruits on the U.S. team, followed by Boston College, Boston University and Notre Dame with three each.